Seattle, named after Chief Sealth, and	otherwise known as the Emerald City, is situated on the West Coast of the USA below Vancouver, Canada. Flanked by the waters of Lake Washington and Puget Sound, surrounded by the snow capped Olympic and Cascade mountain ranges and dominated by the active volcano Mount Rainier, the city is striking with its diverse architecture against this majestic backdrop of nature. The Needle's height and futuristic architecture is the city's most well known landmark. The Observation Deck attracts over one million visitors each year. The Observation deck can be reached by glass walled elevators or by taking 848 steps. Visit the web site for more information on the Seattle Space Needle. Downtown Seattle includes Belltown, the International District, Pike Place Market, Westlake Center, Rainier Square, Pioneer Square, Washington State Convention and Trade Center. Seattle's tallest building, 76-story Columbia Tower is at 4th Avenue and Cherry. 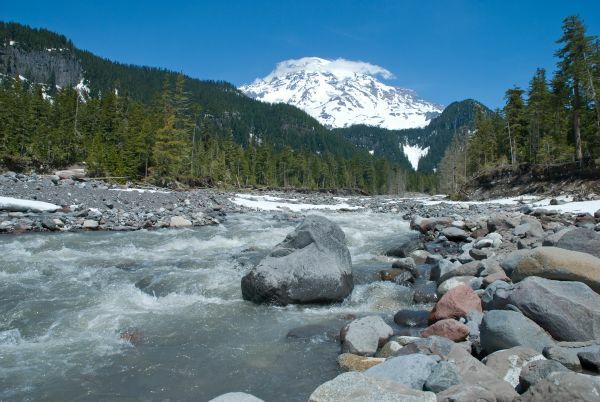 Native Americans refer to it as Talol, Tahoma or Tacoma meaning mother of waters. Just over 80 kms from the city of Seattle are Mount Rainier National Park and the towering Mount Rainier itself, a volcano reaching a height of 4,392 metres. Make no mistake, climbing it is not easy, it's a 2 to 3 day expedition requiring a lot of skills and a high level of fitness. A visit to the park, a hike and a closer glimpse of the volcano are worth a shot though. Familiarise yourself with Seattle's skyline and take a 35 minute ride on a Washington State Ferry to Bainbridge Island. 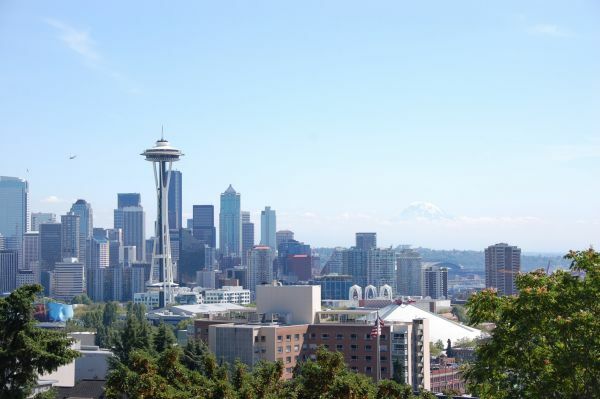 The panorama includes the Seattle Cityscape, Mt Rainier to the East, Bainbridge Island and the Olympic Mountain range. It is here that you will find a diverse range of fresh flowers, fruit and vegetables and seafood. The market was first founded in 1907 as a farmers market and is today protected as an historic district. With its bustling flower stalls, fish sellers, bakeries and musicians it never ceases to delight both locals and visitors. It is also home to one of the first Starbucks locations which opened in 1976. Built by Seattle's first settlers in 1852 after the Great Seattle Fire, Pioneer Square is the historic part of Seattle. Smith Tower, providing an interesting observation deck to visitors and Klondike Gold Rush National Historic Park can be found here. The Hammering Man outside the Museum is said to be "the worker in all of us" and will attract your attention the museum regardless of whether you visit or not. The museum has collections of indigenous art from Africa, Oceania and the Americas. This is a 74 acre park owned by the city with various performance venues and sport arenas including the Experience Music Project and Science Fiction Museum, Pacific Science Theatre and the Space Needle. It was initially created to exhibit Jimmi Hendrix memorabilia and today tells a story of American popular music, science fiction and film by way of interactive exhibits. The museum was the first in the USA to be founded as a science and technology centre. The various interactive exhibits demonstrate science principles and are enjoyed by both children and adults alike. Queen Ann is just outside of the city and provides panoramic views of the city and Mt Rainier from Queen Ann Hill, in particular Kerry Viewpoint. The area stretching from Capital Hill to Broadway is home to Seattle's trendy bars, alternative hotspots and authentic coffee houses as well as the statue of Jimmi Hendrix. This suburb of Seattle is notorious for its sprawling homes and is also where you will find one of the world's largest house boat communities on Lake Union. The city is easy to navigate and is best seen on foot. Take the Harbour steps to and cross under the Alaskan Highway to reach the Waterfront. Visit Pike Place Market for a spectacular selection of fresh seafood and other fresh produce. Don't miss the famous Flying Fish at the fishmonger at the entrance of the Market. A quick ride on the monorail from Downtown Seattle takes you to the Seattle Center. Make it a daytrip and visit the Space Needle, the Experience Music Project and the Children's Museum. Whether or not aviation interests you a tour of the Museum of Flight and the Boeing Museum enlightens visitors with the history of flight and aircraft relics. City tours include bus tours as well as walking tours both above and underground. Travel further afield and go on a wine tasting tour into the foothills of the Cascade mountains. An excursion to Mt Rainier will no doubt be a highlight as it is said to be one the world's most beautiful peaks. The City's main shopping and retail district is University and Stewart and between third and seventh avenues. For clothing, antiques and other collectibles visit Fremont Antiques Mall. Ferries to Bainbridge Island run every thirty five minutes and depart from Pier 52 at the Waterfront. The Observation Deck at the Space Needle is open for day and night time viewing. Have a meal in the revolving restaurant up top. The Columbia Tower also has an Observation Deck and although the vistas are not panoramic the entrance fee and the visitors frequenting the tower are both less than that of the Space Needle. Both the Football and Baseball stadiums, home to the Seahawks and Mariners respectively, are just outside of the city. Depending on which game you decide to attend ticket prices vary from $5 and up and can be bought on the day. Seattle's Best Coffee and Starbucks shops are literally on every street corner. Take a breather and have a cuppa. American beer is alright. There's plenty of it but the lesser known brands and small local micro breweries produce the more interesting stuff. Seattle and coffee, they go together. The state of Washington does produce wine with the general quality being decidedly average compared to their Californian counterparts. A gateway to the Pacific, Seattle has great seafood. You can find excellent hotels in Seattle and Washington State. Many of the main hotel sites will have listings for you. Find Seattle Hotels. There are plenty of affordable hostels and cheap accommodation options in Seattle. Prices vary from hostel to hostel but are generally affordable. Search and book a hostel in Seattle. Seattle and the central area have short term let apartments within walking distance of all the major attractions. Try browsing available Seattle apartments on the web. The main airport in Seattle is Seattle-Tacoma Airport. Visit Seattle-Tacoma Airport for more information. Taxis are reliable and take you straight from A to B. Expensive though. Walking around the city is very safe. Common sense does however apply and being vigilant at night is always recommended. Visit King County for more information.